My sister in-law Annie nick-named this while she laughingly dished this up. 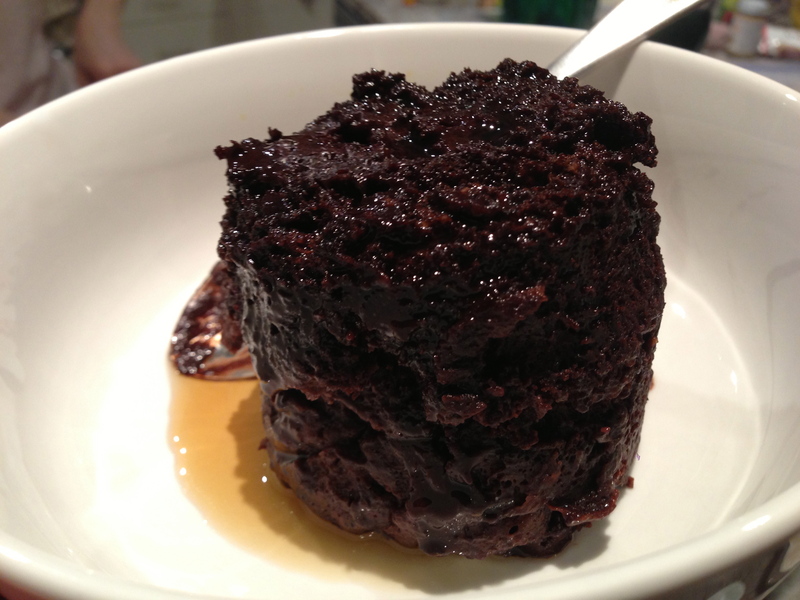 It is actually ‘Chocolate Pudding’ in a cup for which she he showed me two recipes, one Paleo and the other Gluten Free. I have seen many posts about similar things, but never tried one or seen anyone cook these. Some call theirs “muffin in a mug”. Whatever the case, it is fast, which i like of course for entertaining. This is something you don’t need to prep for with a group of people – you can simply wip them up on demand. Probably also fantastic with cream if you can tolerate dairy, unlike myself. My pick of the two was the gluten free version using an Orgran self raising flour and maple syrup for sweetening. The Paleo version used almond meal and some coconut flour with stevia sweetening. Both recipes followed a similar process. This isn’t something i normally do or post, but my sister in-law has 5 kids and bakes a fair amount… with raw food too. If you could call it baking because she does very little heating of things. I found this interesting. It was nice to have her in the kitchen joking about while making this. Mix ingredients a mug and then microwave for about 1 min or more depending on the microwave. Use a fork to help it out of the mug and “plop” it upside down on a plate while still hot. With the Paleo version, i think she substituted the 3 tablespoons of flours with a 2 of almond meal and 1 of coconut flour. I wasn’t really watching that well. She also said she normally uses a little baking powder for her almond version, which i didn’t have – it was a little dense for that reason i think. She also used some very very strong stevia instead of Maple Syrup – a sprinkle. You could use Xylitol too if you consider that to be something you use within your diet program – but it is processed and far from Paleo itself. This entry was posted in Baking, Cooking, Dessert, Dieting, Eating, Food, Gluten Free, Health, Paleo, Primal and tagged Baking, Chocolate, Cooking, Dessert, Healthy, Paleo, Primal, Pudding. Bookmark the permalink. @_0 I… must… try. Thanks for sharing!